Enjoy the luxury of arriving at the airport and having your car parked in the safe Airparks car park for you by a chauffeur as you make your way into the terminal. 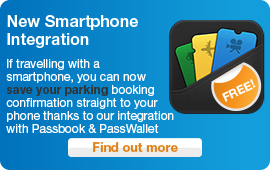 Travel with peace of mind knowing that the car park is holds the Park Mark Award, assuring the safety of your car. The parking compound has CCTV and razor wire fencing around the perimeter with a twenty-four hour security presence. This car park has been awarded the Park Mark for safer parking. The Park Mark means that you are parking in an area that has been vetted by the police to make sure that the site has had measures put in place to create a safe environment. Park Mark-awarded parking areas are run by responsible operators who are concerned with your safety and the safety of your vehicle. From the M56, take the M56 Spur Road sign-posted for Manchester Airport. Please call Airparks on the number provided on your confirmation when you are about 15 minutes from the airport. Your chauffeur will meet you at the terminal. He or she will be wearing a blue Airparks jacket and photo ID. Customers are advised to give their mobile number. If you've not told us which terminal you're flying from, you should call Airparks at least 24 hours before you're due to arrive to let them know. For terminal 1: Follow the signs for terminal 1 departures when you get to the airport. Drive up the ramp to level 11 of the multi-storey car park. Your chauffeur will meet you by the lifts. If you've got passengers, you could drop them and your luggage off on level 5, which is the departures entrance floor. For terminal 2: Follow the signs for terminal 2 departures when you get to the airport. If you've got passengers, you should drop them and your luggage off in the drop-off area, which is just past the second set of departures doors on the left. At the end of the departures lane, turn right into the multi-storey car park. Take the ramp down to level C and turn right at the bottom of the ramp - your chauffeur will meet you here. Your chauffeur will give you a receipt, which will tell you what to do when you come back from holiday. Once you've collected your bags and come through Customs, please call the car park to let them know you're ready. At terminal 1: Take the lift from the terminal back up to level 11 of the multi-storey. Your chauffeur will meet you by the lifts. At terminal 2: Come out of the terminal and cross over to lane 3. Your chauffeur will meet you outside the Budget Car Rental office. If you're going to come back early, please let Airparks know, if you can. Your car will be parked for you in a secure compound. Please note this car park cannot accept bookings for minibuses, high-sided vehicles, hackney carriages, mobile homes, lorries, caravans or trailers, even if multiple spaces are booked. There is a maximum height limit on all vehicles of 2.10m (7 ft). The meet and greet service is ideal for disabled travellers as there're no transfers to the airport needed. See the location of Airparks Meet & Greet in relation to Manchester airport on the map below. Airparks Meet & Greet parking has been rated 95 out of 100 from 4 customer reviews. Mr Dey said "Good value, makes the arrival & return so much easier that parking and transfers by bus"
Mr Sutton said "I didn't get the email confirmation promised, but after contacting Essential Travel I got an adequate email to show the Meet & Greet chauffeur"
Airparks Meet & Greet has been rated 95% out of 100 from 4 customer reviews.